Hanami, an unforgettable moment | PARE MEMBERS' CHAT ROOM! One of the most excited things associated with Japan is Sakura, also popular with another name “cherry blossom”. 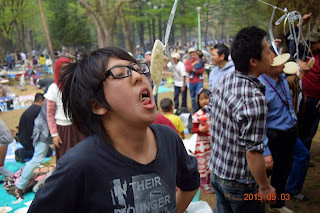 Because it only occurs in Spring season, people seriously prepare special events to enjoy Sakura. This event is well-known as Hanami. Indonesian student association (Persatuan Pelajar Indonesia - PPI) in Hokkaido Prefecture also took part in this wonderful moment (Figure 1). 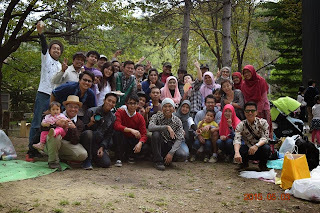 Sunday, 3 May 2015, Indonesia students gathered in Maruyama Koen. Non-student participants also came here. We cooked meat together (barbeque), played game and many other fun activities. Interestingly, several Japanese also joined in our game (Figure 2). It suggests that different culture does not mean incompatible collaboration. Here we displayed that well interaction among people must be improved, to create a good understanding and relationship. Furthermore, in spring season, although Sakura is dominant flower occurring in Sapporo city, including in Maruyama Koen, people also can enjoy tulip with attractive color (Figure 3). 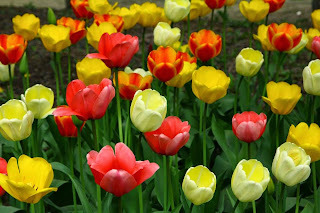 This is very amazing because I have just known that tulip also grow well in Japan. Previously, I think this wonderful flower is only famous and grow in Holland. Although my attendance is not first time in Japan, this is my first Hanami. Thus, I have to spend a good time to enjoy Hanami a lot. However, spring is quite short in Hokkaido, it may be around 2 months. However, this prefecture has a longer winter, and it is the coldest area in Japan. PARE 2015 - Lab of Nutritional Biochemistry, Hokkaido University. This entry was posted in Food Science, Hanami, Hokkaido University, PPI . Bookmark the permalink.